The Front Carrier Block bolts into a purpose-built braze-on on the front of the Brompton's frame head tube. The Brompton Front Carrier Block enables you to carry a Brompton T Bag, C Bag or S Bag on the front of your Brompton bicycle. 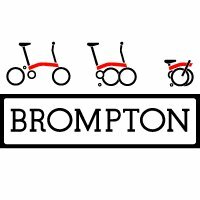 Once secured, the Brompton Front Carrier Block enables you to carry a Brompton T Bag, Brompton C Bag or a Brompton S Bag on your Brompton bicycle.